Well I like realism as much as the next guy, the mix of re-enactment / role play and just good old fun in the woods is what draws me to airsoft. Its why I have a few loadouts, from SO19 and a G36, to post Falklands Border guard and my new 'Modern' look. I have often wondered however what we could do if we stopped imitating 'real' guns and just built something for pure airsoft. One of the reasons I like ATACS FG so much is it works, but its not used by the army as such. 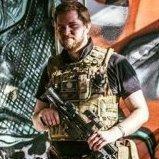 I got a heads up through from redwolf re a new gun today that fits some of what I have been thinking about, being based on no real world firearm (Rather interesting if these became popular, obviously the way VCRA is worded they are still controlled but since they are not based on anything real its rather sad). Its not what I would design, my head is full of a DMR with a built in CQB system using two gearboxes at different powers in 1 gun, triple barrel things in M249 body's and a star trek maco assault rifle with 3 round tracer bursts and popup scope. However it looks damn good, so good I am very tempted to pre-order one. So would you go with something not 'real' that worked well? I quite like the look of it to be honest. It looks a bit like my old type97b without the carryong handle, but with all the bits to cram crap on However I would fit it with a silencer as I found with very short bullpups I was shooting cover, especially with a handle mounted sight. Y'know there's already a thread for this in the Latest News section? Nope, I was a good boy and did a search for the rifle name before posting but it came back blank. That's because it's listed as the UAR not Urban Assault rifle.. Even that wouldn't show up because the search function requires things to be more than 3 characters long... Very annoyingly.